Google AuthorRank: The New Face of SEO? If you are a website content writer, then you need to know that Google has empowered you with a new tool. 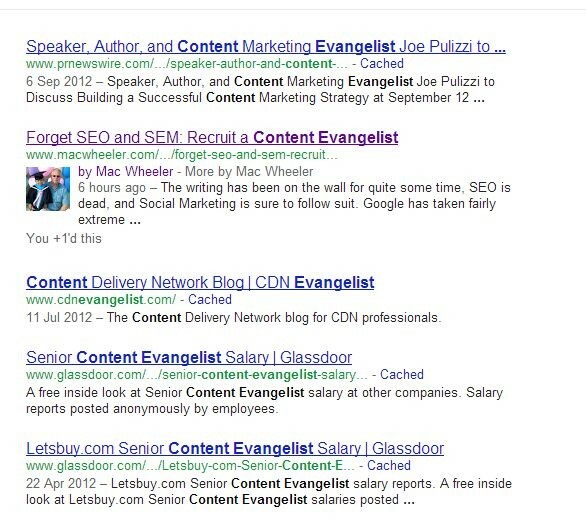 If you are a website owner, then you need to know that who writes your content will soon have a major impact on SERP. In this blog post I cover why Google AuthorRank is of value to both content writers and webmasters alike. AuthorRank is a system for forging a connection between content authors and their content. Whenever an author that is recognized by Google publishes content, a link is made between the page and the author, using the author’s Google+ profile. Notice that the top result in this image has a picture next to it; this is because it was published by a Google recognized content author. This is called a rich snippet, and is one of the new ways in which Google will be promoting pages it thinks should be given more weight. Also notice the two links on the top line. There is a link to the authors Google+ profile (mine in this case), and a link to a list of everything the author has published, and that Google has successfully attributed to them. An author will accrue AuthorRank based on the popularity and quality of the content they publish. Soon, this rank will be added in to the Google search algorithm used for determining SERP for a page. Why did Google Introduce AuthorRank? Google has tried plenty of different ways to weight search results over the years. Initially, the content of the page itself was mostly used for calculating SERP. This included the META description and keywords. The result of this was that people learned to publish pages stuffed with the right words and phrases, to gain SERP artificially. Google wised up to this, and a little while later came up with PageRank. The PageRank of a site or page is driven by the number of external links (backlinks), and the quality of these links, that point at the page. The higher the PageRank, the higher up in SERP a page would be featured in search listings. Of course, people soon learned that by generating hundreds of backlinks, they could artificially raise the SERP of a page once again. Over the last year, Google has made some sweeping changes, starting with the original Panda algorithm update, and then the Penguin update, to significantly reduce the effectiveness of both of these SEO techniques. We also saw the EMD (Exact Match Domain) update being rolled out, which drastically diluted the effect of using a domain name which contained keywords associated with the site. AuthorRank has been introduced as an additional search metric that enables Google to return a site in SERP based on the quality of the site content, as well as the traditional indicators of site value and popularity. If you are a content writer, you need to realize that your AuthorRank is soon going to be your online footprint. Everything you write, which is attributed to you, will help you gain AuthorRank as long as a) it is of good quality, and b) it is popular. The higher your AuthorRank, the more weight your reputation as a content author will lend to the site which published your content. It should be very easy to see the significant benefits of building and maintaining a good AuthorRank. However, Google has been smart this time around, and it will be very difficult to raise AuthorRank artificially. Very soon, Google will start adding AuthorRank in to the algorithm for determining the SERP of a page. This means that any page which has been written by, and linked to a Google recognized content author, will receive a boost in SERP. How much of a boost will depend on the AuthorRank of the writer. Additionally, when a page that is linked to a Google recognized author is returned in search results, it will feature a rich snippet, which makes it stand out from other results. Lastly, content that Google has linked to a content author can never be stolen. Regardless of how many people scrape your site, and republish your content on their own sites, the unique content flag will always be anchored with the author, and your site. It should be apparent to website owners that leveraging the value of Google AuthorRank is going to be a major consideration in the future. I am a professional freelance content marketer, with over ten years of experience in creating all forms of content, as well as defining and driving content marketing strategy for major international companies. If you have a content marketing project I might be able to help with, then please feel free to contact me through this site. This entry was posted in Search Marketing and tagged Google, SEM, SEO. Bookmark the permalink. Windows 10 & Office 365 Cannot Connect Over OpenVPN – Fixed!